If you are organising an Alice in Wonderland themed party then look no further, as you’ve just found the best addition to your event. Robert performs as the Magic Mad Hatter. 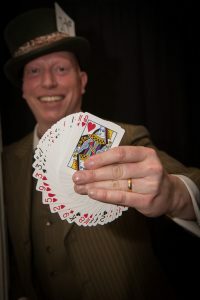 Please note that this isn’t just Robert performing his usual magic but wearing fancy dress (as most “Mad Hatter” magicians so), but a character developed by studying the original books by Lewis Carroll. The Mad Hatter Does Magic! Over the years there have been many interpretations of the Hatter (and the other characters in Alice’s Adventures) so instead of trying to copy a specific style Robert has created how he imagines the Hatter. This means that instead of trying to copy the mannerism of Johnny Depp (whilst performing magic!) he can bring his own personality to the character – whilst importantly remaining true to Lewis Carroll’s original vision. 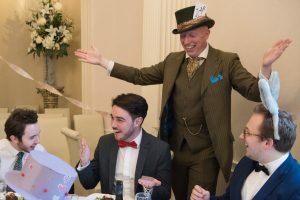 It also means that if any of your guests are wearing Mad Hatter themed costumes Robert will still stand out from the crowd. But not only is the costume unique, but so is the magic and performance. 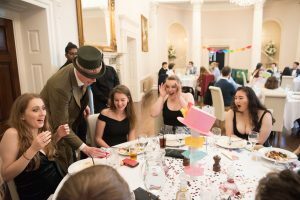 Robert can include much of his popular repertoire that customers already love – and entertains groups and whole tables, but this is presented with a twist that keeps the performance within the theme. Not only this, Robert has developed some special tricks that are unique to the Magic Mad Hatter! The performance isn’t just limited to close-up, but can also include performing cabaret on stage. 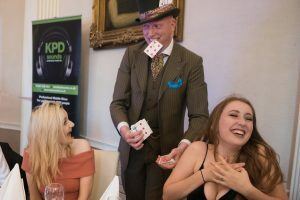 For larger events the Magic Mad Hatter can also be booked alongside Magic Alice – a professional female magician – who likewise as an Alice in Wonderland themed performance. And for the full Alice in Wonderland theme package see www.magicteaparty.co.uk, where the full range of options can be seen.